Candeo Candle Handmade Soy Candles - Made in the USA! Let your cares melt away as our rich, true to life fragrant Soy Candles fill your home with aromatic bliss. We take pride in making each candle with only... -Lead free cotton wicks. -Pure USA grown, renewable, GMO-free Soy Wax. -A blend of the finest essential oils and fragrance oils made with plant extracts. -Recyclable tins that are manufactured in the USA. Our candles will burn cleanly without the soot, smoke and harmful chemicals that many other candles emit! They will fill a minimum of 1000 square feet with fragrance, and are strongly scented from the very first burn, to the very bottom of the candle. You will love how durable our travel tins are! You don't have to worry about glass breakage during shipment, in your home, or while traveling! Plus you have the added bonus that once you are done with the candle, the tin can easily be recycled, or reused in your home. We are so confident that you will love your new handmade soy candle, that we offer a full money back guarantee! 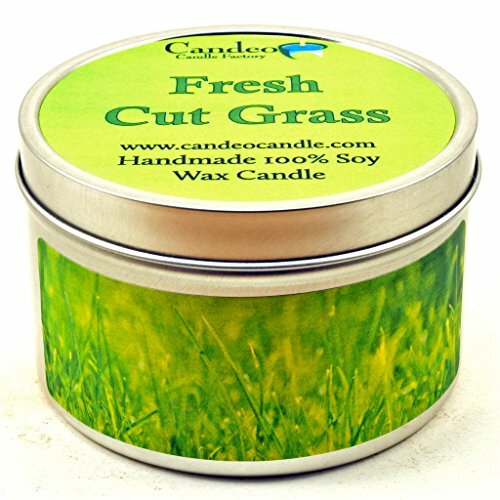 The fresh, green scent of fresh cut grass! If you have any questions about this product by Candeo Candle, contact us by completing and submitting the form below. If you are looking for a specif part number, please include it with your message.